The first thing I did (as all Kindergarten teachers do) in the beginning of the school year was assess each child’s reading level. I assessed them on letter names, letter sounds, and sight words. I also had them try to read a few words and a little story passage. After I collected the data, I then placed the children into 1 of 3 ‘Reading Groups:’ BEGINNING/LOW, AVERAGE/ON, or ABOVE. I thought to myself, well, I KNOW am not the only teacher who has divided ‘Reading Groups’ and I am surely not the only teacher who appreciates reading resources that make their children successful and feel confident! So, I started to use my ‘home-made’ sight word readers with a non-profit in Orlando called, Frontline Outreach. These children helped me discover what book ‘themes’ I would write about and what vocabulary words I would use. 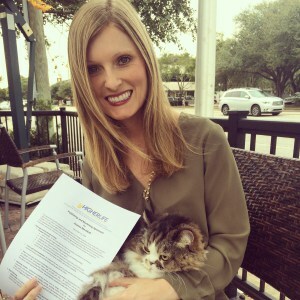 I then pitched, ‘Mush Mush Readers,’ (named after my friendly, fluffy cat) to A HigherLife Publishing company… and MEOW! I got my readers published! Mush Mush and I would be honored if you used these 10 amazing early sight word readers as reading resources!! LOVES College Football! Saturdays in the fall you will find her watching the Seminoles or ‘Huskers! 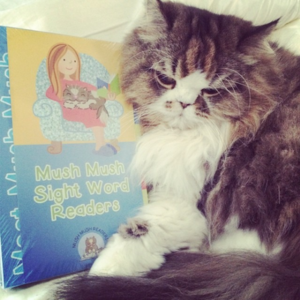 Keep a look out for more ‘Mush Mush Readers’ to come!